As a handyman or even a tradesman, you know that a toolbox is a must-have. You might have been gifted one of the best toolboxes out there, or you might have gone out of your way, for the love of the trade, to get yourself top-of-the-line tools. But, do you have a circular saw? Is that the best circular saw you’ve set your eyes on and owned? Whether you are renovating the deck, fixing the fence, making new furniture or framing the house, an investment in the best of circular saws pays off well. Understandably, however, your search for the ideal circular saw might not be coming along too well because there are too many of the saws. We want to simplify your search hence this piece. This is a comprehensive review of five of the best circular saws in UK. A review based on a detailed analysis of the features that make excellent circular saws – the right blade size, blade adjustability, usability, power, blade material/ durability, weight, power cord/ battery, side of the blade, and accessories. Makita is slowly becoming a household name when it comes to circular saws, and this Makita Brushless DHS680Z is one of the additions to their stellar line of the 18v Lithium-ion cordless machines. This saw boasts a new brushless motor along with a host of in-built features which are poised to make this the most popular circular saw on the market. As mentioned above, this saw boasts one of the most efficient brushless motors. And if you’ve had your hands on the brushed and the brushless saw motors, you know that the brushless motors offer impressive benefits. Without a brush in the motor, no battery power goes to waste – there is no heat generated from friction, the case with brushed motors. So, other than the prolonged battery power per charge, the battery’s efficiency increases and the saw achieves an even higher capacity. The brushless saw will, therefore, cut faster and longer than the brushed motor saws, and it also cuts through tougher materials. But that is not all that the brushless motor offers. With this kind of saw, the touching or moving parts are absent hence a lower rate of wear and tear/ damage. This would mean that the brushless motor circular saws last longer than the brushed motor saws. Automatic Speed Control: this is the other impressive feature of the Makita DHS680Z. The automation of the speed control that comes from the inbuilt computer chip lets you choose the best cutting speeds for your projects. The speed control will reduce or increase the cutting speeds of the saw when needed resulting in improved energy efficiency. The speed control will, therefore, help you get more from your saw in terms of the battery power and even the blade. Power: Powered by an 18v Lithium-ion battery, Makita DHS680Z boasts a high no-load speed of up to 5000RPM. At this speed, the saw delivers a maximum power output of 680watts. It has a relatively low vibration factor of 1.5m/sec. Battery alert: aren’t you tired of the saws that die out without any notice? Well, that will not be a problem with this cordless saw thanks to its 3 LED lights which will always let you know how much battery charge remains. That well, you get to control your work environment for maximum efficiency. Safe Operation functions: The saw features a handy electronic current limiter which prevents overloading, as well as a large lock-off lever for enhanced safety. Its wide base gives the saw stability while its ergonomic soft grip, lightweight and compact design give you ultimate control and comfort when sawing. You might also like its twin LED job light that illuminates the workspace and the piece you’re working on. Also present is an electric brake for control and safety. Durability: the saw’s blade is die-cast magnesium. This material is also used for the guard. Die-cast magnesium is not only lightweight but also durable. Note that the magnesium base has a bevel cutting capacity of 45 and 50 degrees, and you can adjust the bevel angles easily with the rubberized levers. The other impressive features of this Makita DHS680Z include the soft-start allowing for smooth starting up of the saw and the blower which blows off sawdust from the cutting line. Besides the blowers, there saw has a rear dust exhaust port and a dust-nozzle attachable which you can connect to a vacuum cleaner to reduce the mess. Its tool hanger is strong enough to keep the saw hanging when not in use. The brushless motor enhances the durability and efficiency of the saw. 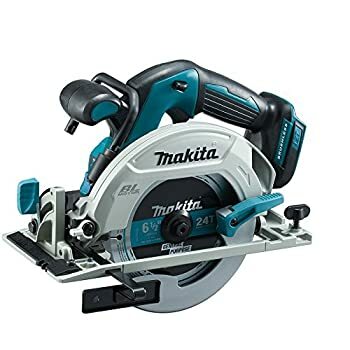 If you are looking for an affordable circular saw from Makita’s inventory, you might want to consider this 190mm circular saw, the Makita HS7601J/2 which boasts a cut depth of 66mm at 90 degrees and 46mm at 45 degrees. Makita HS7601J/2 boasts a high no-load cutting speed of up to 5200RPM. With all this power, you’d expect the saw to be the noisiest, but it is not thanks to its double insulation which result in the noise sound production of only 87 decibels. This saw is corded, which though restrictive in terms of working location ensures the continuity of work. It has a bore diameter of 46 mm for efficiency. Its bevel cuts from 0 degrees to 45 degrees and to increase its maneuverability, the bevel angle is adjustable, and the saw compatible with the guide rail. The saw boasts a compact, lightweight and aesthetically-pleasing design and the rear dust exhaust port connectable to a dust extractor will keep your workspace neat. It features a rear angular guide which makes for precise and smooth adjustment of the bevel angle. You can also adjust your cutting depth using the single-action lever. The soft ergonomic grip enhances ease of use of this circular saw. Its aluminum base plate offers stability, and the aluminum die-cast cover enhances safety. It also comes with a flat-motor housing end. You can connect the dust nozzle to a vacuum cleaner. 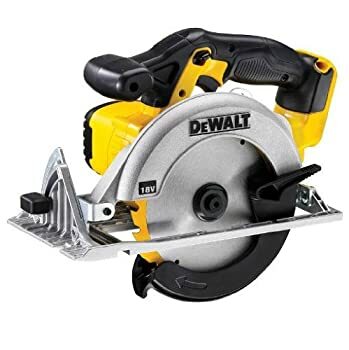 DeWalt is a renowned name in the world of saws, and this is one of their best saws yet. It is priced competitively, and this cordless circular saw promises a high cutting efficiency. Employing the latest technologies, this saw is a premium circular saw which delivers more power for longer than other cordless saws thanks to its XR Lithium-ion battery. The intelligent technology used to make battery makes for the saw’s efficiency and its fast cutting speeds. 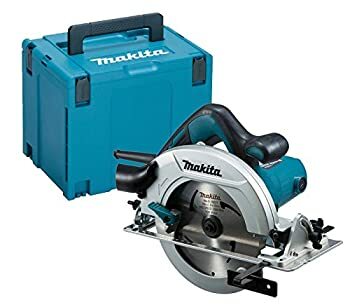 Though marketed as one of the most powerful DeWalt circular saws, its power/ cutting speed is comparably low than what you get from other saws like the Makita’s reviewed above. It’s highest cutting speed stands at 3700RPMs, and the power output stands at 460watts. You will, however, get more from the battery thanks to the saw’s brushless motor which is more efficient and long-lasting. For comfort when in use, the saw has a rubberized ergonomic handle. Precise, repetitive cuts come from the saw’s intelligent trigger which gives you total control over the saw, as well as the die-cast magnesium base. The keyless cutting depth and bevel angle adjustment come with an easy-to-read scale which allows for maximum versatility of this cordless saw. You can also change the blade easily and fast thanks to the spindle lock. You might also like the 165mm ultra-thin kerf and the 24-tooth blade with a carbide tip for fast cutting. Looking for extra control or safety? The saw comes with an electronic brake and a lock-off switch, just for that. 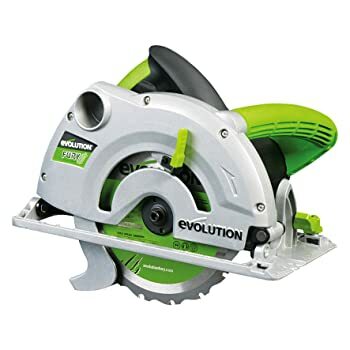 If you are looking for a circular saw to use in your home workshop, you might want to consider this Evolution Fury 1-B saw. This saw is a cordless circular saw that uses Evolution’s patented multi-material cutting technology. Its blades have been optimized to cut through mild steel effortlessly. You could also use it to cut through non-ferrous materials/ metals, plastic and wood. An impressive feature of the saw is that it leaves a flawless/ workable finish when cutting through mild steel; it doesn’t burr, produce heat, or spark. Therefore, you can easily use this saw to cut through reclaimed timber fill of nails and old screws. This saw also boasts an impressive 1200W hi-torque motor, a superb maximum cuts 60mm deep, and a bevel tilt of 0-45 degrees. The cutting angle and its powerful motor, coupled with the 16 teeth F185-TCT versatile blade with a 185mm diameter and a 20mm bore diameter make this one of the most efficient saws. Precise and clean cuts also result from the clear line of sight given by the saw. 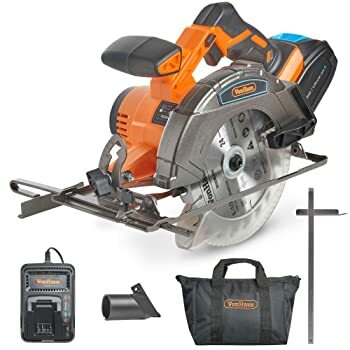 If you are buying a circular saw on a budget, you might want to consider this cordless saw that features a long-lasting with 3.0Ah Li-ion 20V Max battery. A powerful circular saw, this VonHaus saw cuts through wood effortlessly. Its motor has a no-load speed of 3800RPM, and you can make joint and bevel angle cuts thanks to its adjustable cutting depth. The saw also gives straight and bevel cuts thanks to the 165mm industry-standard TCT-tip blade. The standard blade means that you won’t have a difficult time finding a replacement. Most handymen prefer this blade for its 54mm cutting depth at 90 degrees or 40mm at 45 degrees. The blade’s arbor size is 16mm. The cordless design enhances its flexibility and portability indoors and outdoors. The battery has a 30-minute run time. To enhance its flexibility and ease of use, the saw features an ergonomic rubber grip for the handle. You might also like the saw’s dust extraction system featuring a dust extraction port which collects accumulated dust as you cut. The D-Series Lithium-ion battery is fast charging, and the battery is interchangeable with all the D-Series VonHaus batteries. The saw also features a charge indicator LED light. Power saws, whether they’re circular saws or jigsaws, are extremely popular with both professionals and amateurs. If you do any amount of construction or woodworking, we recommend investing in one of each. Combined, they’ll let you tackle tasks as diverse as slicing through lumber to build a deck and cutting ornate patterns in a piece of furniture. At first glance, the hundreds of circular saws on the market may all look alike, but dig a little deeper, and you will see that they’ve each got specific — and sometimes minor — design or performance features that set them apart. Each model may offer different advantages and challenges, but they’re all designed with one purpose in mind: to chew through wood. (With the right blade, you can also cut ceramic tile, steel or masonry.) Circular saws are the workhorses of the power saw world, single-minded and efficient. Consider the kind of work you’ll be doing. Even the wimpiest saw may suffice for building the occasional birdhouse, but more ambitious construction projects require more power. Let’s take a look at the factors that should be influencing your purchasing decision. Circular saws have two main uses: cross-cutting and ripping. Cross-cutting is when you slice across a piece of lumber; ripping is when you saw with the grain, usually though a flat piece of plywood. Any circular saw should be able to accomplish either of these tasks without much trouble; where they will differ is in the design. Some pros swear by a worm-drive design, which positions the motor in line with the blade. Worm-drive saws deliver impressive amounts of power — hence the contractors’ propensity to choose them — but they’re also heavier and cost more. A more popular option, especially for homeowners, is the sidewinder design. This is the one that springs to mind when you think of a circular saw. The blade on this type of saw is attached directly by a shaft to the motor. They’re cheaper, lighter and easier to operate than worm drives. A cordless saw leaves you unfettered by a power cord. Some of the latest perform far better than earlier models–at least until the battery runs down. But some are far less powerful and cut far more slowly. A weak saw can bog down on tough jobs such as thick hardwood. And a slow-cutting saw is frustrating when you have lots of wood to cut. Speed also affects safety. You’re more likely to push a slow saw, dulling the blade quickly and overheating the motor, or making the saw jam or kick back. That’s why we think most serious do-it-yourselfers would be happier with a corded saw or even both corded and cordless versions. Expect to pay anywhere from about £100 to £150 for the best homeowner models. Manufacturers are devoting plenty of resources and attention to design, from the tip of the handle to the bottom of the saw’s base (also known as the shoe). The handle on a sidewinder circular saw can be either a pistol-grip design or a bail handle, which lets you grip a horizontal bar. Most handles are non-movable, but ergonomic features such as adjustable handles are popping up on a few models, which let the user adjust the saw to their posture, rather than the other way around. Jigsaws usually employ a pistol-grip design, with varying levels of padding and trigger size. Many have a secondary handle, too, which makes it easier to keep a good amount of control while you cut. All the saws are loud enough when cutting to warrant hearing protection. And all kick up a lot of chips and dust, so wear safety glasses or goggles. Also, a circular saw blade can’t tell wood from fingers. Always use safety goggles and hearing protection, and don’t wear loose clothes and jewelry. Depending on what you’re cutting, you may also need a respirator or dust mask. And, remember, a circular saw is not a substitute for a chain saw, and as with any saw, you need to install the proper blade for your specific cutting task. The general rule is to install a ripping blade for cutting with the wood grain and a crosscut blade for cutting against the grain in dimensional lumber. Additional wood-cutting-blade designs address unique tasks like clean cuts in finish trim or simply cutting plywood. There are also specialized blades to cut materials like concrete, metal, and tile. The next time you need to shop for a replacement blade, note the diameter of your current blade and its arbor shape. If you’re unsure which blade to get for a particular job, ask for help at the store or check the manufacturer’s Web site. Whichever blade you buy, keep it clean and sharp. And the blade should be flat with no bent or broken teeth. A dull blade and bent teeth are potential causes of kickback, a jerking of the saw from your grip that can result when the material you’re cutting binds the blade. Kickback can also send the wood flying towards you. Whatever you’re cutting, adjust the saw beforehand so that no more than about the height of a saw tooth protrudes beneath about 1/8 of an inch. Use only as much blade you need to clear the material being cut, reducing the likelihood of kickback. Should you need to hold back the guard to begin a cut, keep yourself balanced, hold the guard open by hand (never secure it open), and release it as soon as you’re past the point at which the guard would have interfered. A cut can easily go awry if you’re trying to compensate for going off the cutting mark. Clamp down a straightedge like an aluminum carpenter’s level and leave enough offset for the kerf of the blade–its thickness counting the extra clearance the teeth will need. Keep the power cord away from the path of the saw. Any extension cord you use in should be rated for the amperage of the saw. And if you’re working in your garage, outdoors, in a damp or wet place, or near any source of moisture, plug the saw into a GFCI-protected receptacle. Never cut anything that isn’t supported beneath. Better still, having two supports on either side of the blade’s path–more if the lumber is long and thin, such as 2x4s or molding–helps ensure that the wood won’t pinch the blade in the middle of a cut and cause kickback. Clamp down anything that might shift in the middle of a cut. Not having both hands on the saw is taking unnecessary risks. Should the blade begin to bind or slow down, don’t force it even if you’re near the end. (You might hear a screech of warning.) Stop cutting at once, but wait until the blade stops spinning to pull the saw away. Adjust the material you’re cutting or its supports to relieve the imbalance, and try again. Wait for the blade to stop spinning completely before you set down the saw. The best circular saw is efficient, powerful, easy to use, and durable. The blades reviewed above have different specifications, but each saw offers something you need. If still confused, filter your search by looking at the blade size/ material, build of the saw, power, power source, and cutting angles.